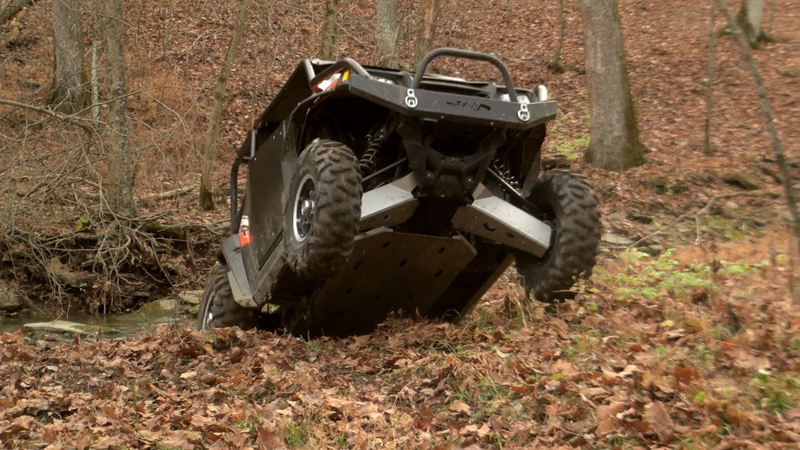 polaris_rzr_s_test_maier_motoplex_2013_creekIf you have a base-model RZR, RZR S, or RZR 570 with non-rebuildable shocks, chances are you will at some point be in the market for new shocks. 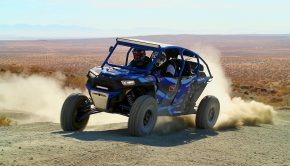 If you have a base-model RZR, RZR S, or RZR 570 with non-rebuildable shocks, chances are you will at some point be in the market for new shocks. 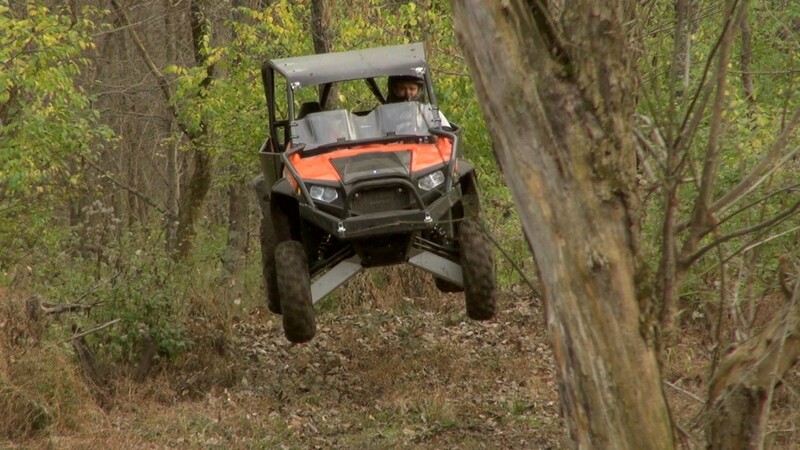 Of course, adding a good set of aftermarket shocks can make a huge improvement in the way your machine handles. Available through ZBroz Racing, Exit UTV shocks are produced in the USA by the same people who brought you ARS-FX Chassis components for UTVs, ATVs, and snowmobiles. 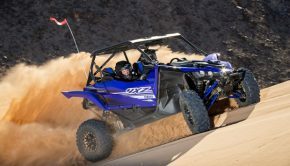 They have suspension offerings for older machines like the original RZR and our RZR S 800, in addition to the latest machines like the Polaris RZR S 1000. 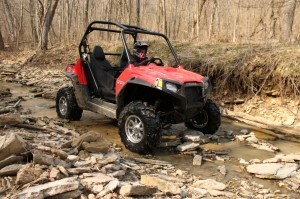 Exit offers many different UTV shock options to suit your specific performance needs and budget. Developed with extensive testing, they feature a two-inch bore and use speed-sensitive damping; providing fluid action over low-speed obstacles like G-outs without feeling harsh on abrupt high-speed impacts. Large piggyback nitrogen reservoirs improve oil cooling reducing fade. They feature a tough black anodized finish said to provide long lasting good looks. 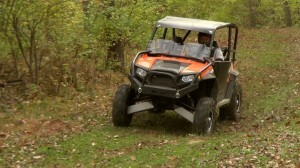 For the RZR S, Exit’s entry-level X0 shocks, feature preload adjustment and retail for $1,900. The X1 adds compression damping adjustment at $2,100, and their X2 shocks add compression and rebound damping, retailing for $2,300 for a set of four. Exit’s entry-level X0 shocks, feature preload adjustment, the X1 adds compression damping adjustment, and their X2 shocks add compression and rebound damping adjustment. The shocks’ threaded preload adjustment is handled by a single locking ring that’s easier to adjust and looks cleaner than the typical dual ring design. The knob on the reservoir controls compression damping, while the knob at the base of the spring controls rebound damping adjustment. 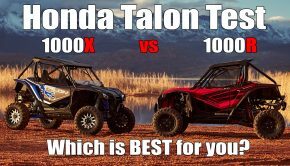 Both adjustments provide smooth action and strong, positive clicks making fine tuning your suspension easy out on the trail with no tools needed. Exit builds their shocks to order, based on your vehicle, chassis setup, additional weight from accessories, and intended use. They back their shocks with a 60-day ride guarantee to make sure their performance meets your expectations. We gave our set of Exit’s X2 shocks two go rounds. The first on our project RZR S 800, which suffered from non-rebuildable and minimally adjustable, stock Sachs shocks. New, they weren’t that bad; but once the oil starts breaking down, they’re junk. 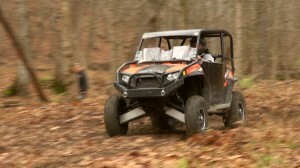 The second test was on a RZR S LE, outfitted with a few accessories. Its Fox shocks were pretty tired. Even with their adjustments maxed out, they were still bottoming out on bigger hits. On our first go around, we weren’t extremely impressed with the Exit shock’s performance. They would have worked well for short course races with smooth tracks and lots of jumps. However, their setup was off , even for aggressive trail riding. We zeroed out their spring preload and compression damping in an effort to curb their harsh feeling on small bumps. When we were done, they bottomed out on bigger hits, without much improvement in their ride quality over small stuff. We sent the shocks back to Exit and requested a plusher setup, better suited for the average, sport-oriented trail rider. Pulling no punches, we were concerned how the shocks would perform when they came back, but within 10 feet of hitting the trail, it was obvious that they had gone through a significant change. All of the small bumps that we would have noticed on our first test had magically disappeared. 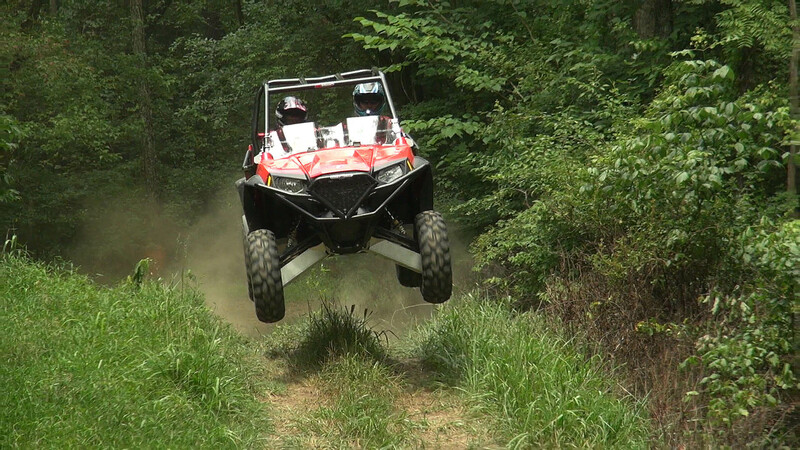 Exit’s X2 shocks made the car feel impervious to small bumps from roots and rocks. Cruising the trail at speed, harsh hits from square-edged holes and bumps were beautifully dampened. within 10 feet of hitting the trail, it was obvious that they had gone through a significant change. All of the small bumps that we would have noticed on our first test had magically disappeared. As we became more aggressive, the front shocks’ performance felt flawless right out of the box. Compared to the fronts, it seemed that the rear end was using a little more travel and rebounding a little faster on g-outs and some uneven high-speed bumps. We increased preload a couple of turns and slowed rebound damping two clicks, which balanced the ride and allowed the machine to track even more predictably in uneven bumps. This time, a little adjustment went a long way. 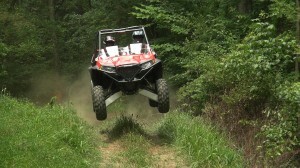 A few feet of air from jumping out of a creek, or hitting a large, water break size jump was no problem. The Exit shocks provided a smooth landing and never seemed to bottom out. One of the things we really liked about the X2 shocks in our first test was how flat the car stayed during aggressive cornering. We are happy to report that our revised shocks’ plusher ride has not come with a substantial increase in body roll. Cornering is still relatively flat, and we were amazed how much harder we could drive the machine into and out of corners, compared to the stock Fox shocks. we were amazed how much harder we could drive the machine into and out of corners, compared to the stock Fox shocks. In round 1, Exit shock’s performance was in question. However, in round 2, they came back and delivered a decisive knockout! Admittedly, we may have over-emphasized our interest in jumping a bit on the first test, having some impact on Exit over-valving our shocks. Exit made good on their ride guarantee, and based on our feedback, delivered exactly the ride we were looking for. Compared to a brand new set of RZR S shocks, Exit’s X2 shocks delivered a ride that was plusher over small bumps, offered more bottoming resistance on big nits, and improved cornering stability. Whether you’re racing or just trail riding, you can’t ask for much more. Exit’s X2 shocks delivered a ride that was plusher over small bumps, offered more bottoming resistance on big nits, and improved cornering stability. Whether you’re racing or just trail riding, you can’t ask for much more. 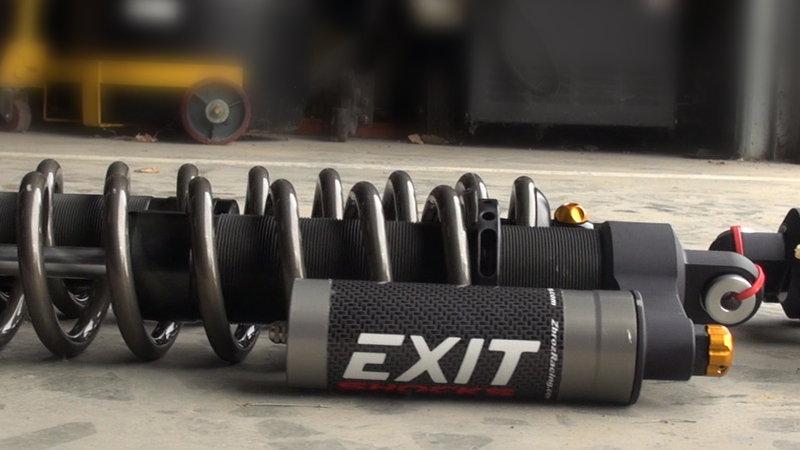 In the end, Exit’s X2 shocks deliver superb performance for the dollar in a field of premium, feature-packed shocks. If you’re a recreational driver looking for a simple, affordable replacement for your worn out stock shocks, Exit’s custom-built base model, XO shocks deliver the same out-of-the-box performance for a few hundred dollars less. 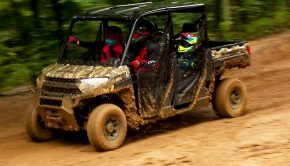 American-made construction, superb customer service, and, most importantly, performance are all reasons that we wouldn’t hesitate to recommend or use Exit shocks for our UTV suspension needs. Summary: Exit’s X2 shocks delivered a ride that was plusher over small bumps, offered more bottoming resistance on big nits, and improved cornering stability. Whether you’re racing or just trail riding, you can’t ask for much more.